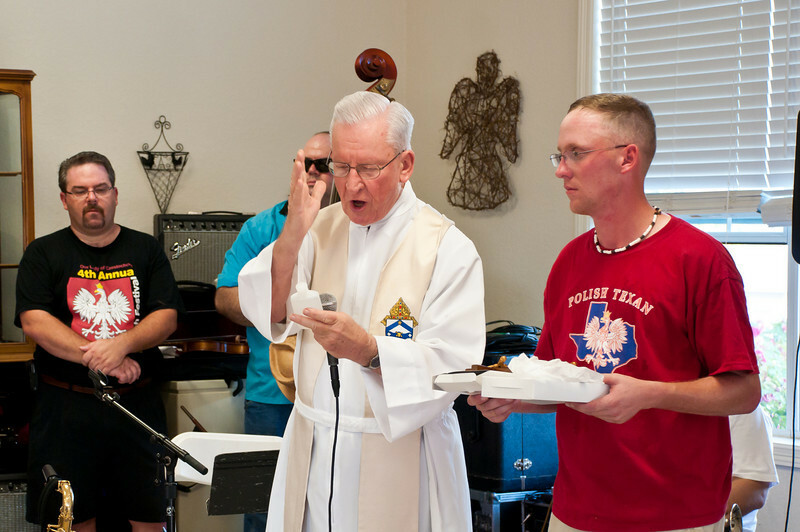 Monsignor John Malinowski celebrated the 50th anniversary of his ordination to the priesthood on Saturday, May 25, 2013 in Bryan, Texas. Born in Chappell Hill in 1935, the oldest of six siblings, Fr. John has been a part of the Bryan-College Station community for 40 years. He currently serves the Bryan-College Station area as chaplain at St. Joseph Hospital. The celebration began at 11am with a Mass at St. Anthony Catholic Church which was celebrated by Bishop Joe Vasquez of the Diocese of Austin and concelebrated by Fr. Benedict Zientek, Fr. Adam McCloskey, Fr. Jozef Musiol and dozens of other priests. Over 800 people attended the Mass and reception. Following communion, Father Jozef Musiol, Brian Marshal, Mike Kurtin, Mike Addicks and Dr. Jim Mazurkiewicz sang 5 verses of “Serdeczna Matko” in Polish as a special tribute to Monsignor Malinowski. During the partitioning of Poland in 1795, this song became the spiritual national anthem through the unity of the Catholic Church. The original lyrics were forbidden to be sung to this melody so the lyrics were changed to honor “Our Holy Mother”. To this day “Serdeczna Matko” is sung praising our “Holy Mother”. The original lyrics told of the people longing for freedom. Through this difficult time, the Catholic Church provided the unity for the Polish nation until they became a Republic again in 1989. To this day, Poland is unified through the Catholic Church. After Mass, a reception was held at the Brazos County Expo Center with a catered meal, program and live musical entertainment with Central Texas Sound and Polska Kapela. Monsignor Malinowski wanted to showcase his Polish heritage to the many parishioners that he has served over the past 50 years and he asked Jim Mazurkiewicz and his band to play at the reception. The Polska Kapela band which played old time Polish music consisted of Brian Marshall, Jim Mazurkiewicz, Frank Motley, CJ Jozwiak, Mark Hopcus, Charlie Brossman and James Mazurkiewicz.